December 14, 1953 – Mayor Martin Kennelly receives authorization from General Service Administrator Edmund F. Mansure to begin running the Congress Street expressway through the post office building and across adjoining railroad tracks to the Chicago River. On the same day, the Public Works Commissioner Virgil E. Gunlock obtains authority from the Civil Aeronautics Administration to revise development plans for O’Hare Airport in order to prepare the field for civilian passenger operations by the summer. Kennelly and Gunlock consider the authority to build the highway from the post office to the Chicago River a major victory. The Chicago Daily Tribune reports, “Gunlock said some of the city’s leading lawyers had told him he never would be able to get the necessary authority to build the super-highway over this short stretch of land. He said the mayor and he considered their success in this more important than getting authority to put the super-highway thru the post-office building.” [Chicago Daily Tribune, December 14, 1953] Projections peg the cost of pushing the road through the post office building at $1,176,200 of which the city will pay $600,000 and the federal government $576,000. The photo above shows the east side of the post office on August 11, 1954, complete with holes punched through it to make room for the expressway, a road that one can see under construction on the other side of the building. December 14, 1937 – Kate Sturges Buckingham dies at her home at 2450 Lake View Avenue at the age of 79. The Chicago Daily Tribune observes, “To tell the life story of Kate Buckingham would be to tell the story of Chicago.” [Chicago Daily Tribune, December 15, 1937] Buckingham’s great uncle, Alvah Buckingham, built the first grain elevator in the city in 1850. In 1855 her maternal grandfather, Solomon Sturges, founded the storage elevator business that lay at the heart of the family fortune. That empire crashed to the ground in 1871 when the Great Fire destroyed the elevators on the river. Rebuilding followed and in 1877 the family moved into a new home on Prairie Avenue, soon to become the most prestigious street in the city. When Buckingham’s father died in 1911, he left an estate of over four million dollars. Two years later Buckingham’s brother, Clarence, died, followed seven years later by her sister, Lucy Maud. Kate Buckingham became involved in the Art Institute of Chicago partly as a result of her brother’s influence. Clarence Buckingham had been a governing member of the institution for 30 years and a trustee for a dozen at the time of his death. 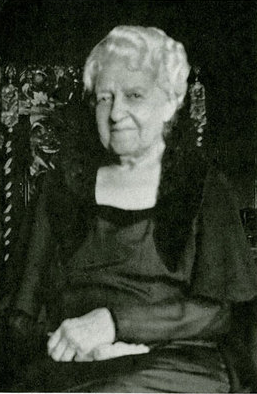 Lucy Maud Buckingham had also assembled a collection of over 400 pieces of Chinese art, which Kate Buckingham presented to the Art Institute in Lucy’s name. She also presented a collection of medieval sculpture, tapestries, and decorative arts to the AIC in 1924 in memory of her sister. Her greatest gifts – Buckingham Fountain and the Alexander Hamilton monument – were given as a memorial without her name attached. At the dedication of the Hamilton monument not far from her final home on Lake View Avenue, Chauncey McCormick said of Buckingham, that she had “a possessive love of Chicago, and she wanted to beautify the city for the people.” [Schultz and Hast. Women Building Chicago 1790-1990: A Biographical Dictionary] You can find additional information on Buckingham and her family here.